You know that feeling when you excitedly reach for a perfect-looking choc chip cookie and upon first bite it feels as though you've just bitten down on a piece of granite? Yeah - I know. The very definition of a first world problem. 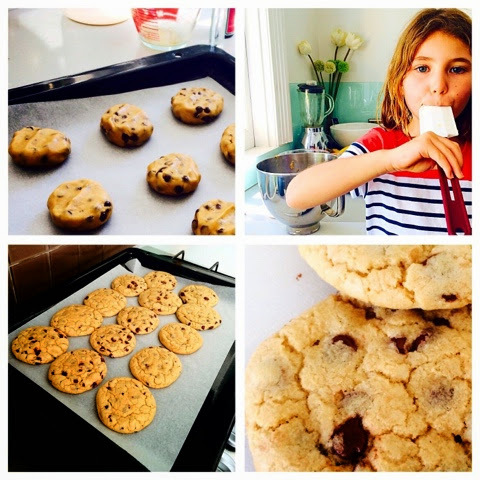 Allow me to introduce you to the easiest, chewiest choc chip cookie you'll ever eat. It's fine. You can thank me later when we're both at the gym working these little beauties the hell off our expanding rear ends cos they're filled with gooey, fatty evilness. Nonetheless, rest assured that every bite is worth it. (And yeah, we call them cookies thanks largely to the generational influence of Sesame Street). Sift flour and baking soda into a bowl, set aside. Cream butter and sugars, then beat in egg, egg yolk and vanilla. Mix in flour and add choc chips. Roll the mixture into balls, place on tray and flatten slightly. Bake for about 12-15 minutes, until very slightly golden. Allow to cool before removing from tray. (Actually no - shove one straight in your mouth five mins out of the oven. Best thing ever and the third degree burns are totally worth it). Get them into your belly, eat several, then hit the treadmill for two hours and pretend it never happened.